Slimming World Diary: Syn Free Sausage Roll Pasties ..
My journey continues but it is not going well, I haven't stopped eating, all bad things as well. I have weigh in tonight where the scales will show my downfall but I'm prepared. I've seem to write this week off, now I'm drawing a line under it, going to group this evening to get my motivation back and start a fresh! I'll let you know what the damage is but I'm expecting about 10lbs (no exaggeration). 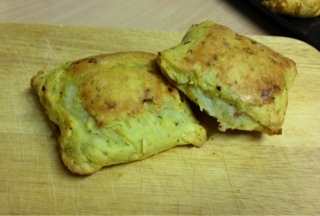 I started my diet back up last night with some syn free sausage roll pasties. Obviously there is no pastry in them. For the outside crust I actually used instant mash. It's not the same as a pastry original but it's a damn good substitute! 1. Chop 1 onion very finely and add to a bowl with the instant mash and mixed herbs, add some hot water, enough to make the mixture into a bread dough consistency. Put in fridge for at least an hour. 2. Preheat oven 200c. Chop second onion very finely and put with thyme, spices and mince, season and knead until forming a paste. 3. Lay out a sheet of cling film on a flat surface and place the mash mixture onto it, then cover with a second sheet of cling film. Using a rolling pin, roll out until a 4mm thickness. Peel back the top layer of cling film and tidy the edges and cut the width you want to the rolls/pasties. 4. Add a layer of the meat mixture and using the bottom layer of cling film roll the mash to form a tube with the meat inside. Seal the join and egg wash.
5. Spray a baking tray with Frylight and place the rolls/pasties on it. Bake in oven for 30 mins until gold brown and crispy. So there we go a syn free alternative to rolls and pasties, this is just a simple filling I decided on, but you can change it up, use a filling you wish just remember to not have a wet filling or this recipe won't work. This looks good. Will have to try it.